Poland is facing a new day of protests against a copyright agreement signed by Warsaw on Thursday. Opponents are staging demos and hacker attacks and say the ACTA treaty amounts to Internet censorship and gross violation of human rights. In order to become law, the Anti-Counterfeiting Trade Agreement must first be voted in by parliament. In a bid to stop this from happening, the hacktivist group Anonymous has targeted official websites in the countries that have already signed it. They struck the Polish, French and Czech government websites, as well as the sites of the Irish ministries of justice and finance, the European Parliament, Ireland’s Innovation Minister Sean Sherlock and Polish Prime Minister Donald Tusk. In Poland, the cyber-offensive has sparked massive protests since Tuesday. On Thursday, tens of thousands flooded onto the streets, with demonstrators clashing with police in Kielche. With public anger still high, the demos are expected to continue. 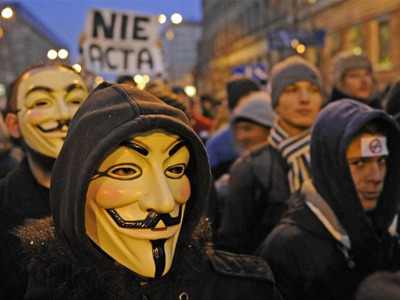 Anti-ACTA sentiment reached the Polish parliament, too, where some opposition MPs put on Guy Fawkes masks to signal that they won’t vote for an agreement that has drawn so much criticism from citizens. Anonymous is threatening that it will reveal sensitive information on officials, should Poland proceed with adopting ACTA. Prime Minister Tusk called the demos and hacker attacks “blackmail”. 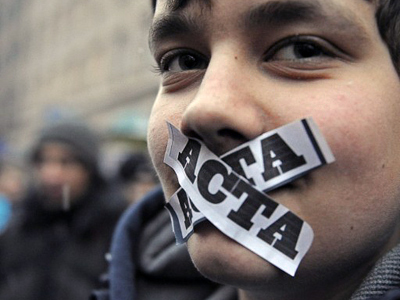 Nevertheless, the protests didn’t stop all the EU countries – bar Cyprus, Estonia, Germany, the Netherlands and Slovakia – from signing ACTA at a meeting in Japan on Thursday. The five missing are expected to follow suit and side with the 22 countries, which have backed the agreement so far. In June, the European Parliament is to ratify the agreement, after which it has to be passed into law by national governments. ACTA aims to harmonize legislation protecting the intellectual property of its participants in areas ranging from the entertainment industry to pharmaceuticals and fashion. The stated goal is to protect copyright owners from online piracy and counterfeiting. Opponents of the agreement however brand it as an attack on civil liberties, which was prepared in secret by non-elected officials, bypassing public control. The exact wording of the document was never revealed, but according to leaked info, ACTA may result in a gross violation of human rights, activists warn. “What ACTA is designed to protect are the rights of those that benefit from the current copyright model, which is completely outdated,” Robert Harris, member of the UK’s Pirate Party told RT. Those could include border searches of digital devices like music players and laptops for pirated content, policing of user activity by internet service providers, and even bans on generic drugs. There is fear that the national governments ratifying the bill will also be obliged to criminalize acts like putting links to pirated content, and to extradite offenders to be tried by the country of the copyright holder. Dominika Bychawska, a media freedom specialist with the Helsinki Foundation for Human Rights, says the Polish government should communicate with users instead of changing Internet policy. “People are feeling they were cheated by the government and that there is something wrong that there were no consultations and there was no possibility of a debate before the signature,” she told RT. The somewhat similar SOPA/PIPA bills in the US caused worldwide demonstrations and a blackout by some of the world’s most-visited websites earlier in January. The protests resulted in the shelving of the controversial legislation.